Texas Academy of Dental Assisting truly does cherish all our students and we celebrate their success in this journey. WE are so proud of our dental assistant school graduates and their commitment to our dental assisting program. The future is BRIGHT and beautiful! Texas Academy is flying high for graduate student Adriana Aguilera. When Adriana seeked us out she was a stay at home mom ready to go back into the work force. Not to say —being a mom is not work! We all know better. However, we are very excited to announce Adriana landed an RDA position in general dentistry in Fort Worth. High five to this graduate! Congrats. Texas Academy of Dental Assisting wants to honor dental assistant school graduates student Hayley Cox. Hayley was working at a country club when we first met her. She enrolled in our school and in just 3 short months she was an RDA-Registered Dental Assistant. Now we are very proud to announce she landed a new career with a general dentist in North Richland Hills. Congratulations Hayley! Texas Academy of Dental Assisting is delighted for graduate student Cheyenne Kahn. Cheyenne was working for a pizza place and decided she wanted more. She completed our dental assisting program in just 3 short months and landed a new career working as a dental assistant for a general dentist in Granbury, Texas. Our whole TADA team is celebrating her accomplishment. Congratulations Cheyenne! 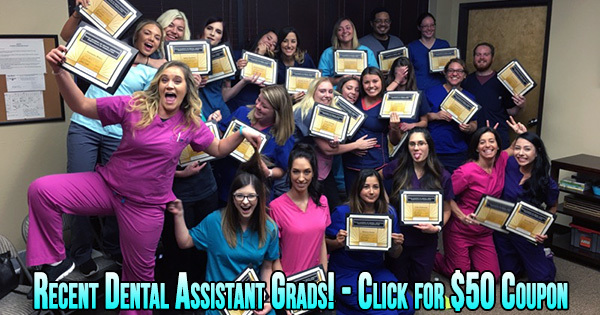 Time is running out…..Take advantage of this opportunity and get a spot in our next Dental Assisting class while there is still room… Email or call us today! « Is it Time for a New Dental Assistant Career?